Two different maps were found for the Lyons Formation for the north part of the basin. One map was published by Sonnenberg (1981) and one by Levandowski and others (1973). The maps have some discrepancies, so we decided to use the latest because this publication also contains permeability data used in this study. In addition, a map from the south part, published by Garbarini and Veal (1968), was combined with the map from the north part, gridded (c3lyons) and added to the GIS data base. 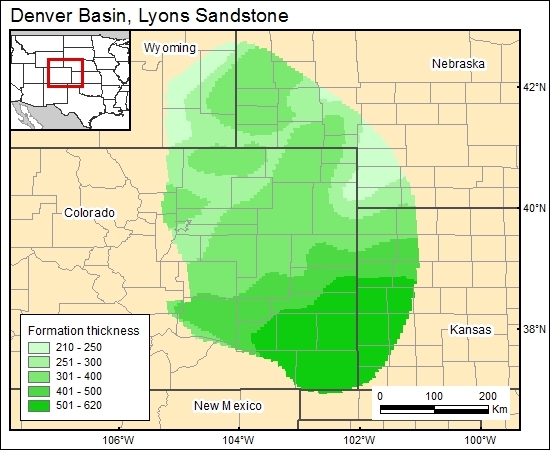 The mapped maximum thickness of the Lyons Sandstone is 300 ft.